﻿ Some of you may know that I'm a panelist of a few survey companies and I give my opinions on variety of topics and products and get paid for it. If you're interested in becoming a paid survey panelist then visit my website at EarningFreeMoney.com. I had the opportunity to be one of the panelist to give a name to the new McDonald's Cherry Berry Chiller and I'm glad to know they've picked the name I've chosen. Now that the chiller is in stores, I wanted to see how this new chiller taste like. I purchased the chiller with a double cheese burger and fries to go with my meal. The chiller looks like McDonald's got some juice and ice and blend it together to make an icy cold drink. 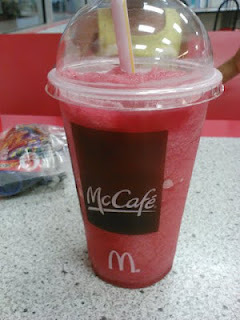 Once I took a sip, it taste like frozen tropical fruit Hi-C drink that usually kids drink. Most of the time you can find Hi-C in soda fountains in almost every fast food restaurant including McDonald's. And if this is the case that McDonald's is using Hi-C to make their chiller, Hi-C is made of only 10% fruit juice and McDonald's claims that their chillers are made with 100% fruit juice. So something doesn't seem to be right. With the chiller tasting just like an Hi-C, I do not like it because I do not like drinking Hi-C! I didn't even finish my drink and just let it melt into a syrup. What a waste! Good thing it's a limited time and I won't be buying it again! Is McDonald's Cherry Berry Chiller Worth a Try? No, don't waste your money. Go buy some Hi-C and freeze it. LOL!